What can I send to New Zealand? What items are restricted? The majority of shipments enter New Zealand without being stopped by customs, however, they may stop any shipment at their discretion for further inspection or processing. Shipments held by customs cannot be cleared by Send My Bag and will require self-clearance to be arranged directly by the consignee in person or via our courier partner as advised on our destinations page for New Zealand. Additional clearance delays and fees will also apply. New Zealand is a great destination for adventure hunters and there is no shortage of activities to try. Canoeing and kayaking are popular choices, as well as climbing, hiking and skiing. Those who want a more laid back holiday can relax while fishing in some of the best lakes in the world, or play a round of golf against impressive natural backdrops. Whatever you plan to do in New Zealand, you can avoid paying the excessive baggage charges that airlines tend to charge. Send My Bag can collect your heavy luggage or sports equipment and deliver it to your destination for a fraction of the price, allowing you to travel light in a hassle-free way. Our service can deliver your heavy or bulky luggage and equipment to your destination quickly and securely, so that you can enjoy your holiday straight away. Our carrier service is also great for students relocating to New Zealand, whether for their entire degree course or as part of their third year abroad. Being able to ship their possessions to New Zealand makes it a lot easier for students to transition to a new way of life abroad. You could choose to send your luggage and boxes to New Zealand with Send My Bag. This is an excellent solution if you are going on holiday to New Zealand and you need to bring lots of clothing or sporting equipment. It’s also a great option for students who need to bring enough clothes and other everyday items to set up home in New Zealand for a term, or longer. Sending your luggage to New Zealand with Send My Bag means you can bring lots of your favourite things with you to make you feel at home. With your luggage taken care of, you can focus on discovering your new surroundings. To learn more about sending luggage to New Zealand, visit our ‘How it works’ page, or our ‘FAQs’. Golf is a popular sport in New Zealand, with just under 400 golf courses for golfers to choose from. Some of the best courses are: Cape Kidnappers, Kauri Cliffs, Paraparaumu Beach and Kinloch Club. It’s easy to sample these courses using your own clubs by sending them to New Zealand with Send My Bag. This will allow you to travel without the extra weight of heavy clubs. You will enjoy your rounds of golf so much more if you are able to use your own trusty clubs, rather than hiring some when you arrive. Read more about how to send golf clubs with Send My Bag, including how to suitably package your golf clubs. You can also send your own bike to New Zealand with Send My Bag and enjoy the awesome scenery that the country has to offer. You can spend your whole holiday cycling. Just have your bike sent to your first hotel and have it picked up at the last one. Sending your bike to New Zealand is a whole lot easier than checking it into the hold of your plane. You will avoid oversized baggage fees and won't have to carry the bike to and from the airport. Your bike will need to be dismantled and suitably packaged before being sent to New Zealand. Check out our information on bike shipping to learn more. New Zealand is a popular ski destination, with good snow conditions in July and August. Popular resorts include Treble Cone, Cardrona and Mount Hutt. If you prefer not to hire skis when you are there but use your own skis instead, you can send them with Send My Bag. You can send them ahead and have them waiting for you at your accommodation reception, and have them picked up again when you are heading home. To find out more about ski shipping, have a look at our information page. If you are moving to New Zealand permanently, or if you are going there to complete your degree course, you should look into international removals to New Zealand, which will allow you to take your possessions with you. Before the movers arrive, however, ensure that you have packed everything up well so that it arrives in one piece. Make use of sturdy packaging for your items and tape everything up well. New Zealand has a number of world-class universities, including the University of Auckland, the University of Otago and the University of Canterbury. Why not consider completing your degree course at one of these universities and experience New Zealand’s culture and landscapes at the same time? If you are a student looking to set up home in New Zealand, you will need to bring a lot of things with you to make this possible, such as your course textbooks and many other everyday items, like fiction books, clothes and DVDs. This makes shipping your possessions a handy option. Learn more about student shipping on our student removals page and find out how to receive your student discount. It’s no problem to send a parcel to New Zealand with Send My Bag. This is especially practical if you left some items at home when you moved to New Zealand. You can just ask a friend or family member to place the items in a box and send them on to you. Or, friends can send you care packages to help remind you of home. Send My Bag can send parcels internationally to New Zealand for you. Just make sure you choose an appropriate box when sending a parcel to New Zealand and seal it up well so nothing gets damaged in transit. Find out more about sending a parcel and learn what you can send with Send My Bag and how to package your items. You could try air freight to send large bulky items. This would normally take one to two days, which tends to be faster than sea freight shipping, but more expensive. The amount you will have to pay when shipping by air freight depends on the weight and size of your shipment. You may also have to pay for the services of a customs agent to handle customs clearance for you. If you send internationally by air freight to New Zealand your items will likely arrive at one of the major airports, such as Auckland, Christchurch or Wellington International Airports. Alternatively, if speed is not a priority, you could opt for sea freight or container shipping to transport your possessions to New Zealand. Again, sea freight is normally used when shipping large bulky items, such as a cooker or sofa, which are loaded onto cargo ships in containers. This is normally cheaper than air freight, but you will still need to pay for the services of a customs agent and will need to arrange how to get your items to and from the ports. When using container shipping to New Zealand, your items will arrive at a major port, such as Timaru, Napier or Wellington. I sent a suitcase of winter clothes to my son in NZ from the UK. I had 1 question for the customer service team and they answered it straight away and where very helpful and friendly. New Zealand customs require a completed NZCS218 form (provided by Send My Bag) and a copy of the receiver’s passport to clear items. New Zealand has a strict Biosecurity System, therefore shipments containing items such as foodstuffs, or wooden products may result in the items having to be cleared via New Zealand Biosecurity, which can result in customs delays and additional charges for inspection. Biosecurity may also take interest in any products that may have been in contact with plants and animals outside of New Zealand, including but not limited to, shoes, hiking equipment and other outdoor sports equipment. Customers should ensure such items are thoroughly cleaned prior to shipping. New Zealand customs may insist that shipments are self-cleared by the consignee before the items are released and delivered, and Send My Bag are unable to assist with process. If you opt for our shipping agents to do this, they will levy a fee of c.$230 to submit customs paperwork and gain customs clearance for your items. This service is performed directly between the receiver and the agent’s customs broker, with Send My Bag unable to provide assistance. Alternatively, the consignee can visit a New Zealand customs office and self-clear the shipments at a reduced fee of c.$46. If clearing at a customs office, please note that, when customs officials release your items to you, they will provide documents that need to be emailed to the delivery agent to allow final delivery to take place. The New Zealand Customs authority has 14 offices throughout New Zealand that can process self-clearance requests. New Zealand has a gift allowance of $110, where the ‘gift’ is unsolicited (not ordered or paid for by the recipient) and is of personal nature. Shipments containing gifts for more than 1 person are acceptable provided each gift is individually wrapped and clearly marked for the intended recipient. Each recipient has their own $110 allowance, however allowances cannot be shared. If the gifts for 1 recipient exceeds the $110 allowance, GST will fall due on the entire shipment. Although known as the ‘Paradise of the Pacific’ for its natural beauty, New Zealand also has some great cities. Auckland is a modern cosmopolitan city with a culture rich in entertainment and nightlife, whereas Rotorua is a great place to visit for those wanting to experience Māori culture and see the wonders of the geysers, and relax in the hot pools. New Zealand’s weather is somewhat difficult to predict because of its geological location, but it generally has a mild to warm climate. Temperatures for the main two islands varies between 11°C in the winter to 24°C in the summer, but be warned, the weather can change quickly so be prepared with a coat, even if it looks like glorious sunshine. English and Māori are both official languages of New Zealand, with English being spoken by the majority of locals. Māori is spoken by the minority in New Zealand, usually by the Māori themselves and language learners. Some knowledge of Māori pronunciation may be useful when visiting the far-north of the country. 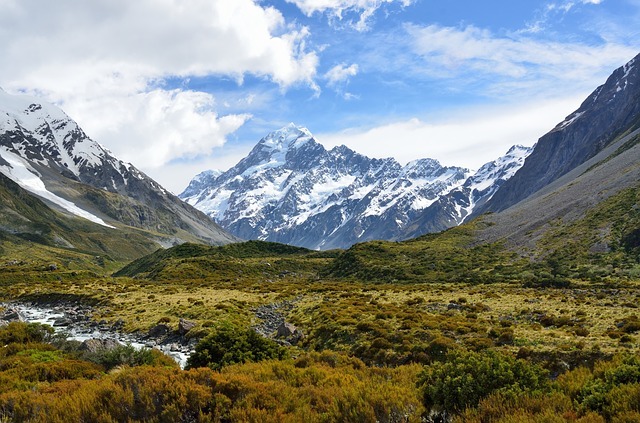 There is plenty to see and do in New Zealand, but the majority of visitors go to see the stunning scenery and take part in outdoor activities. Mountains, lakes, volcanoes and geysers are spectacular, truly nature at its best, but don’t forget to check out New Zealand’s unique plant and animal life too.